Double sport world champion Rebecca Romero has set her sights on the Olympics after her astonishing success at cycling's world championships. 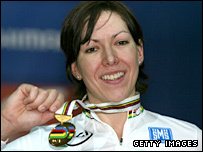 The 28-year-old won gold on Thursday in the individual pursuit just two years after switching sports from rowing. Romero quit a successful rowing career because of a back injury after winning a silver medal at the 2004 Olympics and gold at the 2005 world championships. "Following that up is the tough part but it's only upwards now," she said. "If you ride with a passion, if you start with that, it feeds you." Talking immediately after beating world champion Sarah Hammer to take gold in Manchester, Romero compared her achievements in the two sports. "Both (world championship gold) medals were fantastic," she told BBC Sport. "But this was more a personal battle rather than a long-time thing with the rowing. "I wanted that so badly. I'm so knackered and so relieved. I didn't think I was going to do it. I was building up and up and up - that's the most tested I have ever been within my own mental capacity. "Last year I was in the silver medal position. Anything less than a step up, then I'm going backwards. "I've been putting pressure on myself by going in at this level just six months after learning how to be a cyclist. "Building up the training and knowing I need to improve and get better. If I don't do that, it's not working. I just raced my heart out." Romero's achievement in becoming the best in the world in two unrelated sports is virtually unheard of in modern sport. The British Olympic Association says Romero will become the first British female summer Olympian to win medals in two different sports if she makes it to the podium in Beijing. "Basically what you've got with Rebecca is someone who is an excellent natural athlete," British Cycling president Brian Cookson told BBC Radio 5 Live. "She's turned from one sport to another and applied the same level of discipline and motivation to her second sport as she did to her first sport. "She's got that ability to get absolutely 100% out of herself and deliver when it really matters. "Any athlete will get stale from time to time and look at doing other things, but not many will do it as extremely as Rebecca." Cycling has been a huge success story for British sport in recent years, with the likes of Bradley Wiggins, Victoria Pendleton and Chris Hoy enjoying numerous triumphs on the world stage. Romero's gold medal was the fourth of the world championships for Britain, and hopes are high for the Olympic Games in Beijing. "It does look good for Beijing but there has to be one note of caution: you can never guarantee success at elite sport," added Cookson. "Now the pressure is on even more so. We're showing what we can do at the world championships and we'll certainly do our best to repeat that at the Olympics. "We're now the team for the rest of the world to beat which is a good position to be in." Romero made her initial forays into the sport with High Wycombe Cycling Club. The club's president Gordon Wright, who also coaches Cooke, said Romero had impressed him from the off. "We were little bit suspicious about someone from another sport but open-minded as well," he told BBC Radio 5 Live. "Looking back, I have to say that her first time trial was pretty impressive but we're always a bit sceptical until people have done a few more rides. 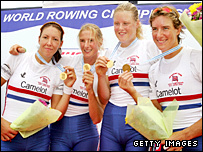 "I think we were slightly in awe of her with her being an Olympic medallist in rowing. "It was her speed that impressed me and the power she was producing, but we probably thought her technique was a little awkward."